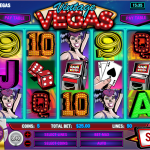 Vintage Vegas is a 5 reel slot game released in 2014 by Rival. It is meant to bring you back to the good old days of Vegas. This mean old casinos, cigars, mafia and of course Sinatra. The Wild in this game is the Cowboy symbol which can substitute other symbols to create a winning combination. The wild can also form a winning combo itself and 5 of him will win you 15,000 coins. 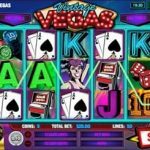 There is one scatter in this game and it is the Roulette and landing 3, 4 or 5 will win you 10, 20 or 60 Free Spins respectively. If the Wild was used to firm a winning combination during this round it will come with an 11x multiplier. 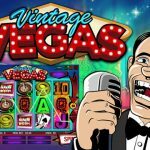 The idea behind this game is great but although it is based on vegas we don’t think that it’s that elaborate and the bonus features are too simple. Also, the graphics could’ve been much better so overall we’re a bit disappointed. If you’re a fun of travelling maybe you should try playing Travel Bug a 5 reel slot by Rival.